Garfield is a comic strip character which was created by Jim Davis. It has been published since 1978 and records the life of the main character - Garfield, his owner - John Arbuckle, and Jon's dog - Odie. As of 2013 the comic strip has held the Guinness World Record for being the world's most widely syndicated comic strip. Garfield is in wonderful condition. He is dressed as Goldilocks and has yellow woollen hair,a dress, spoon and bowl to eat that wonderful porridge the 3 Bears cook. He has his cloth tag to his body. Small rub to one eye. Vintage soft toy with Garfield wearing Garfield slippers on his feet. He is wearing blue pyjamas. This does show a little wear to the colour. He retains his plastic Dakin medallion under his chin, and has his cloth tag to the back of his body. He 13" (33cm)long from tip of tail to front of head. He is approx 9" (23cm) tall from tip of ear to bottom of foot. Garfield is dressed as a sailor and is wearing a sailor hat and sailor type jacket. On his jacket it says "I'm Sorry". It is white in colour but does show wear to the white. He has his cloth tag to his body. Garfield is dressed as the Easter Bunny Rabbit and is carry a straw type asket for the eggs. He has two front felt teeth poking out of his mouth. He is 13" (33cm) tall from tip of ear to bottom of his feet. Its Garfields 10th birthday in June 1988. Everyone's invited to share om the excitement. It's the year of the party. He is 10" ( 25cm) tall. ﻿6 drink coasters which are coated with acrylic which will withstand temperatures to the boiling point of water and is resistant to normal household stains. To care for these mats, clean with a damp sponge and dry thoroughly with a soft cloth. Do not immerse in water. These are very bright and colourful. The coaster with Garfield in his box having a midnight snack has a couple of little wear marks to the coating. Hard to see unless you are really looking﻿. 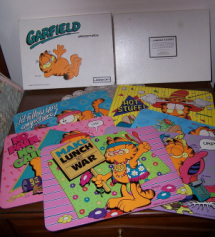 6 matching Garfield placements to the above drink coasters which are coated with acrylic.They will withstand temperatures to the boiling point of water and is resistant to normal household stains. To care for these mats, clean with a damp sponge and dry thoroughly with a soft cloth. Do not immerse in water. These are very bright and colourful. The lid of the box has one split corner. 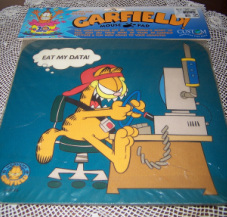 This mouse pad displaying Garfield driving a computer is of old stock and still sealed in it's plastic bag. The top cardboard cover says "20 Years of Garfield PARTY ON"
"The most popular cat in the world is ready to run riot on your desk! 20 years of Garfield attitude and fun now comes to your computer". The metal book stand is in a pink colour and has 4 transfer pictures of Garfield on it. At the back the stand can be place in 6 graduating different heights. There is a metal lever at the front to stop the book from coming off the stand. It folds flat when not in use, and easily stored away for convenience. The back has some scratches to it but nothing too bad as when it is in use you will not see it.